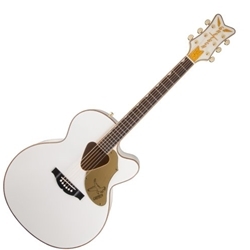 Adorned with a distinctive triangular soundhole and stylish pickguard, The Gretsch G5022CWFE-12 Rancher jumbo cutaway acoustic-electric guitar will transport you back in time. The Rancher Series from Gretsch, originally introduced in the early '50s, stood apart from the standard models of the day, due to their unique design. The G5022CWFE-12's solid spruce top, which is reinforced with scalloped X-bracing, delivers an unbelievably rich, resonant sound that will add an air of significance to everything you play. You'll even be ready for exceptional plugged-in performance thanks to the built-in Fishman Isys+ preamp system and Sonicore undersaddle pickup. Whether played acoustically or amplified, the Gretsch G5022CWFE-12 Rancher jumbo cutaway is ready to take you back in time! While most of the Gretsch guitars you see at Sweetwater are hollowbody electric guitars, Gretsch has been producing top-notch acoustic guitars longer than most of us have been alive. The G5022CWFE-12 Rancher jumbo cutaway pays homage to the distinctive Rancher guitars from the early '50s, retaining their iconic triangular soundhole and priced so that anyone can enjoy this piece of Gretsch's history. Whether you're a performing artist or just want a great vacation guitar, you'll love the classic vibe you get from the Gretsch G5022CWFE-12 Rancher jumbo cutaway.